Thanks to everyone who entered the olive oil giveaway last week. After searching for a random number generator, I found one on random.org--who knew there even was such a site? The winner is Nami from the terrific blog Just One Cookbook. 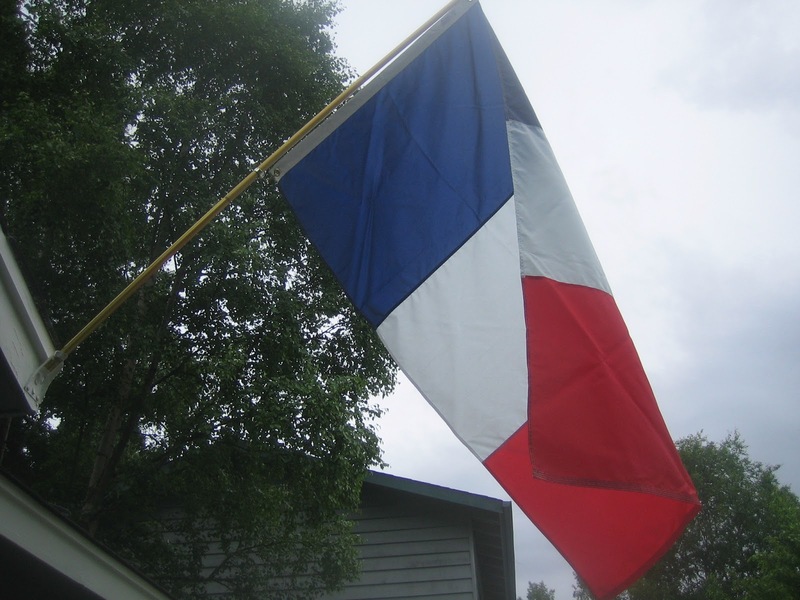 Yes, we have a French flag. David is obsessed with flags. 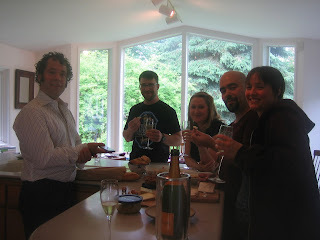 My friends Scott and Kathy used to celebrate Bastille Day every year--sadly, they've deserted Alaska and moved to Kentucky, but this year David and I hosted a small Bastille Day dinner to keep the tradition strong. Since it's been chilly and rainy here in Anchorage, David made Julia Child's beef bourguignon and ratatouille, and I whipped up a frozen white chocolate mousse dessert (coming Friday!) and some savory madeleines. You read that right. Savory madeleines. My mouth waters just thinking about them. We had two couples over for dinner, so David proposed that I halve the original recipe because two madeleines per person sounded like enough. I refused, which was the right decision. These little suckers are good, and there wasn't a leftover madeleine to be had. If you don't have a madeleine pan lying around, the recipe suggested a mini muffin tin--not a bad idea, though obviously not as pretty. Make sure that your pear is really ripe--mine was not quite there, and had less flavor as a result. Preheat the oven to 350 degrees. Whisk together the flour and baking powder in a small bowl and set aside. 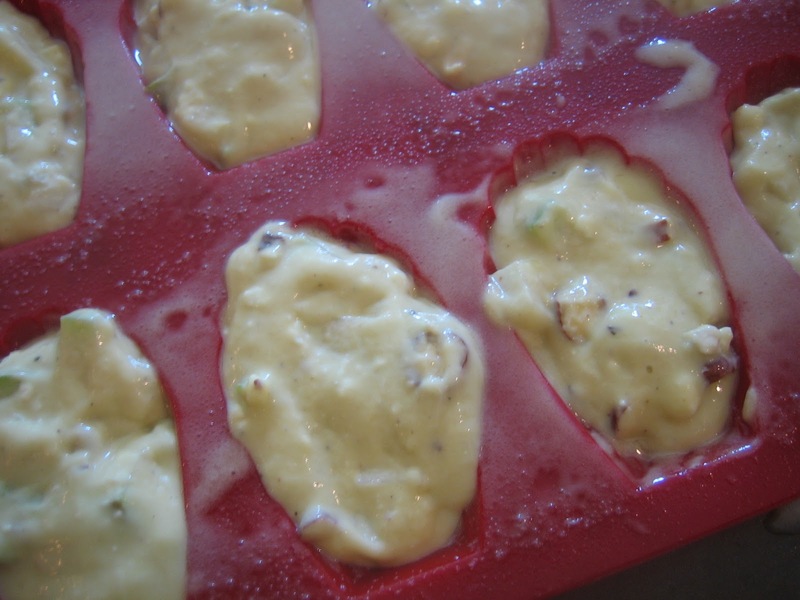 In a larger bowl, whisk together the eggs, salt and pepper, then add the buttermilk, oil and crumbled cheese. Whisk the dry mixture into the wet one until just combined, then fold in the pear and hazelnuts. Spritz your madeleine pan thoroughly with baking spray with flour, and then fill the molds two-thirds of the way full with batter. Bake for about sixteen to eighteen minutes, or until a toothpick inserted into one of them comes out clean. Cool for a few minutes on a baking rack before unmolding. Oh my goodness, what a great combination of flavors. These sound incredible! Congratulations to Nami for winning the olive oil! I'm jealous! :) Just going through the ingredients for these madeleines, my mouth is watering. Interesting combo with the blue cheese and hazelnut. Now onto these delicious madeleines, I don't think I've ever had the savory kind but they sounds incredibly delicious! love the blue cheese and hazelnut combination. Congrats to Nami. I will need to use the muffin tray because I don't have the Madeleine baking tray. You added black pepper inside, wow I am loving it and these you baked looks great. Oh you made me miss Paris. I loved being there for Bastille Day -so much fun. Your Madeleines look and sound so yummy:)! Happy Bastille Day! Very delicious looking Madeleines - Proust would be proud! If anyone is deserving it is her! I love your savoury madeleine creation, what a stunner! Those sound delicious! Your dinner menu has me wishing for cooler weather so I could make those dishes. Alas, not going to happen in 105 degree weather! Wow, those madeleines look delicious, awesome combo of flavors! Happy Bastille Day! Yummy! These look so fantastic! I so love a Madeleine, reminds me of my grandmother, but never saw a savory one.Adore pears and blue cheese! Oh what a great idea! I need to get myself a Madeleine pan for my new house! Oh my -- these Blue Cheese, Pear and Hazelnut Madeleines look unbeliveably divine! I'm sure they were a perfect accompainment for your bourguignon and ratatouille. Your gust were very lucky! Your madeleines look (and sound) terrific! In fact, your whole menu sounds incredible!!! I LOVE the savory element to your Madeleine's!!! 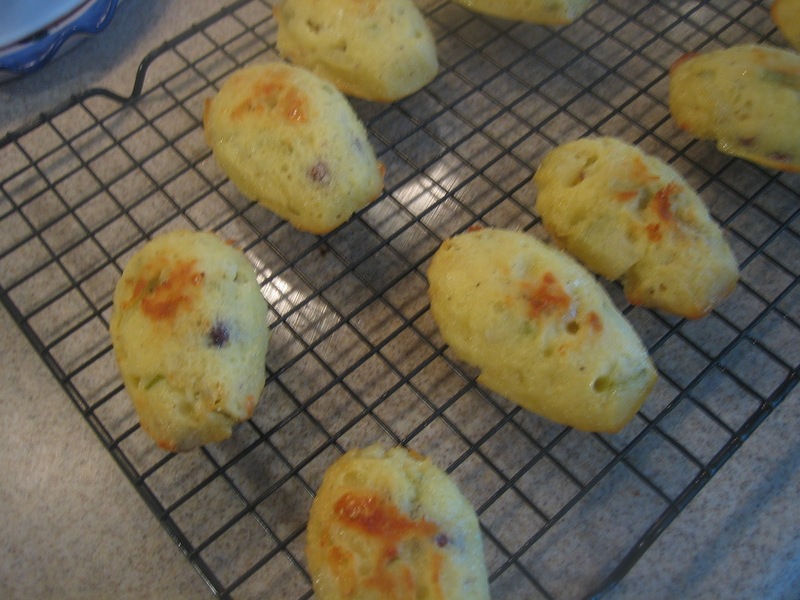 I love the idea of savoury madeleines! The only time I celebrated Bastille Day was the summer I spent the month of July in France, but what a great idea to celebrate it wherever you are!